All products distributed/manufactured by Accupart International carry a limited warranty which provides that they are free from defects in material and workmanship under normal use and service provided they are properly installed in the components or on the vehicles for which they are intended. Our limited commercial warranty is for 1 year (12 months), after date of purchase. The basic warranty is in lieu of all other warranties expressed or implied, including any implied warranty or merchantability or fitness for a particular purpose and of all other obligations or liabilities on the part of Accupart International or any of its customers, including liability for damage to the property of persons of for consequential damages, nor shall it apply to any labor charges incurred for removal of said unit from the vehicle. This warranty shall not apply to any product which has been repaired or altered by anyone other than Accupart International, or which has been subject, in the sole judgment of Accupart International, to improper installation or maintenance, to misuse, negligence, accidents, or fire. Accupart International reserves the right to make changes in the design of, additions to, or improvements in, its products without incurring any obligation to modify or make similar changes of products previously manufactured of sold. 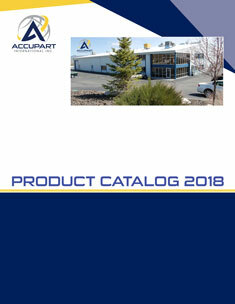 Accupart International neither assumes nor authorizes any other company to assume for it any warranty or other liability of obligations in connection with the sale, ownership or use of Accupart International's products. Accupart International limits its warranty obligation to the replacement or credit of the merchandise purchased; warranty determination will be made at our plant by our personnel.